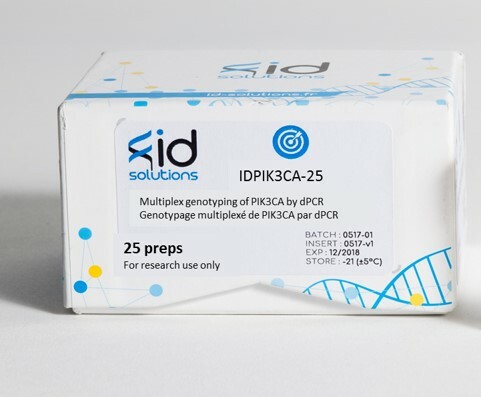 The IDPIK3CA kit is a ready-to-use multiplex system that allows for each sample to detect and quantity the E542K, E545K, Q546K, H1047R and H1047L mutations of the PIK3CA gene (phosphatidylinositol-4,5-bisphosphate 3-kinase catalytic subunit alpha) in a single digital PCR reaction. Somatic mutations contribute to the increase of PIK3CA kinase activity thus participating in cell transformation. Colorectal, cerebral and gastric cancers show a high rate of mutations of the PIK3CA gene with frequencies of 32%, 27% and 25% respectively. Breast and lung cancers have a relatively low rate of PIK3CA mutations (8% and 4%, respectively). These somatic mutations are dispersed in most exons, but are mainly found in the kinase and helical domains of the PIK3CA subunits. It should be noted that hot spots were found in exon 9 (E542K, E545K, Q546K) and exon 20 (H1047R/L). This kit can be used on circulating DNA and DNA isolated from formalin-fixed and paraffin-embedded tissues (FFPE). It is compatible with the following instruments: Digital droplet PCR QX200 (Biorad) and Naica system digital droplet PCR (Stilla). For others, please contact us. The IDBRAF kit has been validated for the detection of E542K, E545K, Q546K, H1047R and H1047L mutations present on FFPE extracted DNA in comparison with NGS.